no one to talk to?" If you are moving to the highlands of Panama, Volcan, Boquete or Altos Del Maria, then let me assure you, all these places have ready-made ex-pat communities just waiting to welcome you. 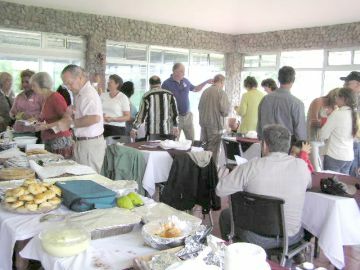 Volcan, as a case in point has the 180 plus Highlanders Society that meets on the first Sunday of each month for a potluck lunch. On a recent Sunday about 40 people, mainly middle aged couples, met at a local restaurant to sip wine, eat a variety of different dishes and thereafter to discuss certain local issues such as the need for an ambulance. I think it's fair to say that isolated ex-pat communities, like the one in Volcan, value their community ties far more than if they were back home in the US, Canada or Europe. Here people rely more on each other for help and advice-because they are in the same boat, so to speak-strangers in a strange land. The Volcan Highlanders are an amazing group with people from all walks of life and backgrounds. A former homeland security officer, pilots, lawyers, car dealers, secret government communications workers. A nearby community even boasts its own ex CIA operative. Panama, your new home, does not have to be one of isolation and loneliness. Far from it, you may have a more active social life than the one you had before. Some of the parties in Volcan have really gone hog wild and ended in a literal burst of fireworks. When you move to a new country with a different language, don't let anyone mislead you, it's not easy. It takes quite a bit of courage to say goodbye to old friends, familiar places and a predictable way of life. But the wonderful new experiences and friends that await you will more than compensate for any perceived loss. 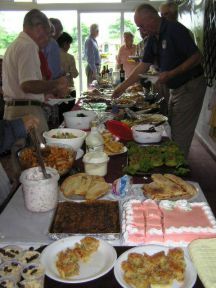 I am sure many a new person has sat in a Highlanders Potluck and looked around at their 40 to 60 new found friends and after a sip on a glass of wine thought, "yes this is it, this is Panama, our new home."